Flat Top restaurant can be found not only in Chicago but throughout Illinois, Indiana, and in one spot in Wisconsin. The Flat Top I visited was in the Loop, 30 South Wabash. 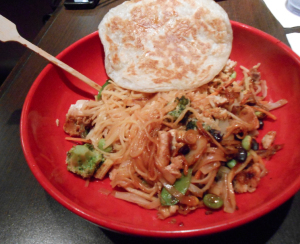 Flat Top is a make-your-own stir-fry style restaurant. Once seated you take a little wooden paddle like stick and write your name on it. Then you make your way to the bar with your name stick and a bowl. This restaurant is super friendly towards people with allergies, or that are vegan or vegetarian. Working your way through the bar you select rice or noodles and then your vegetables. You can pick as many and as much as you would like. Then you can add the sauces. I picked a korean bbq sauce. They have little cups, the kind you would put ketchup in, so that you can try the sauces and make a decision. They also have combination suggestions on the wall. Then in a smaller red bowl you can pick your protein. They have chicken, beef, pork, fish, tofu and a ton of other options. It’s best to fill your bowl as much as you’d like because it won’t look quite as full after they’ve cooked it all. They have colored sticks by where you drop off your bowls to have them cooked. Each of the colored sticks means something else to the cooks. The two in mine are a request for egg to be added and for a piece of bread. They have other options as well, some of which cost extra and others that tell the cooks if you have an allergy or food restriction that they need to keep in mind. Then you return to your seat and wait for you food to be returned to you. The egg is usually small bits of a scrambled egg that was super small and hard to find but a nice addition. The bread I received was flat and tasty. (It’s the large flat round thing towards the top). I really enjoyed eating at this restaurant. They have a student discount as well. 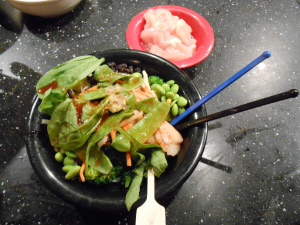 You pay for the bowl, not the individual items unless they’re marked with a price, like some of the colored sticks. I could add as much of everything and it turned out to be wonderfully delicious and it felt like I was eating healthy since I piled on all of the vegetables. I did end up with some random vegetables from other peoples stir fry, but I didn’t mind one piece of baby corn. 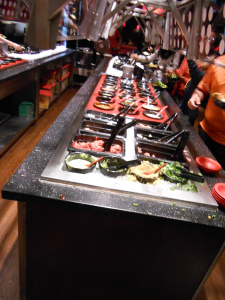 They also do soups, lettuce wraps, mu-shu, some appetizers and dessert. My friend and I split the Triple Chocolate Storm. 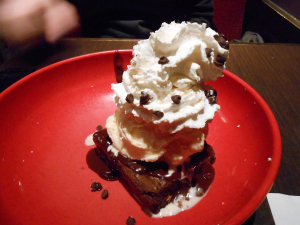 It’s a chocolate brownie covered in chocolate sauce, french vanilla ice cream and whipped cream that they make in house. Flat Top has nice hours for the Loop, where most of the time things are notorious for closing somewhat early. Flat Top is open until 10pm every day of the week. It was nice to pick what I wanted. Their lighting was a bit dark and dim which mixed with the good food made me sleepy but I had a fun time.